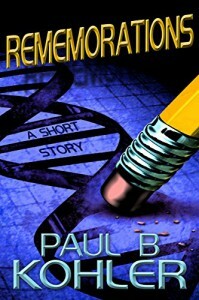 I originally read this story as part of the Immortality Chronicles (one of the anthologies in the Future Chronicles) and was impressed... Paul B. Kohler's Rememorations was one of my favorites in the collection. I actually had to pause reading and just sit and think about how ever person and every decision is tied together in my past, and what the loss of one would do to everything else in my life. While there are some memories I could do without, everything in my past made me the person I am today. That is the decision that Nathan Duncan must make... What memory can he risk losing? It's obvious that the author spent a lot of time thinking about how immortality would work in regards to memories and live experiences. This is a well-written short, and one I would highly recommend.